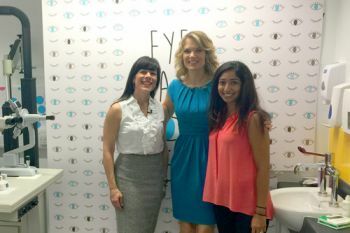 City Sight, City University of London’s state-of-the-art eye care clinic, has been featured on ITV’s flagship programme Good Morning Britain. The breakfast programme chose the clinic as the location to launch its new campaign, 'Eye Can See', which aims to make sure every four and five-year-old child in England gets an eye test. An investigation by Good Morning Britain found that while every child in England should be tested in school, tens of thousands of children are not being tested, putting their sight at risk. They also discovered that many parents do not realise their children can have their eyes tested for free in specialist eye health centres, like City Sight, or through high street opticians. In fact, every child aged 15 or under is entitled to a free NHS eye test. The Good Morning Britain campaign aims to encourage 10,000 more children to have their eyes tested before the end of September. “Good vision is vital for your child's social and educational development at school so it is really important for all children to have regular eye examinations. “The first few years of life are critical for visual development. Problems such as a squint or a refractive error, also known as long or short sightedness, during these early years can lead to a lazy eye”. Roshni Samra is the Clinic Manager of City Sight, based at City, University of London. “Our children's clinic is designed to be child friendly and our staff are very experienced at dealing with children. We offer a comprehensive eye examination and can provide a wide range of spectacles and contact lenses for children if required”. City Sight was officially re-opened in January by then House of Commons Speaker, the Rt Hon John Bercow MP. This followed a re-location to Northampton Square from its original premises near Old Street. The new state of the art clinic delivers a wide range of eye care services to the general public, including eye examinations with state-of-the-art equipment such as 3D optical coherence topography. The facility has specialist clinics for children, contact lenses, binocular vision problems, specific learning difficulties, visual impairment and colour vision defects. The clinic is also used as a teaching facility for optometry undergraduates studying at City, University of London. This gives students in the final year of the course the opportunity to learn through seeing real patients under the supervision of practicing optometrists. Last year, City Sight delivered approximately 2,500 free eye exams, 920 contact lens appointments, and also saw around 300 children in paediatric clinics.